I am back with another Tasty Tuesday and I wanted to share a hole-in-the-wall place that my coworker shared with me. When I think about “Instagram-worthy” foods, I immediately think about Recess. Their treats are gorgeous and vibrant and I really haven’t seen anything like this in Las Vegas yet. For me, this is the first dessert place of it’s type in Las Vegas and I’m so glad that it’s not in Chinatown. 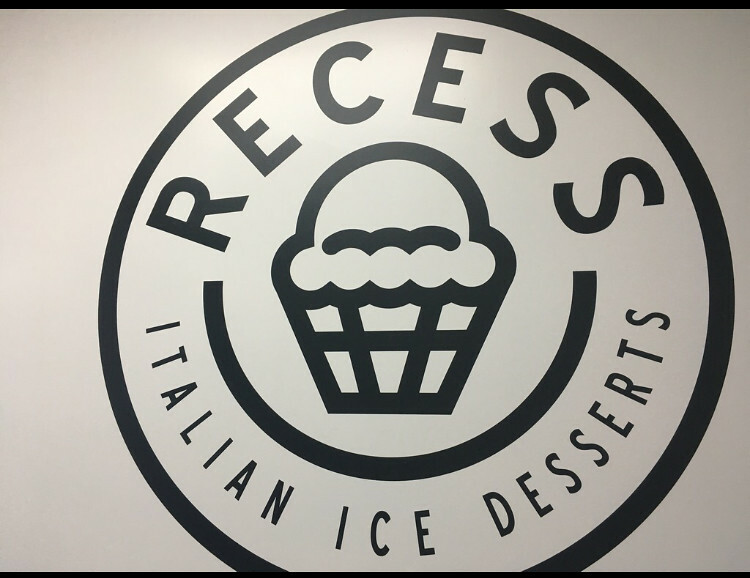 Recess Italian Ice is an italian ice shop that also has custards, boba, taiyaki, and “Asian” twists on custard. Locations: The original location is in San Jose, California and the second location is in Las Vegas, Nevada. 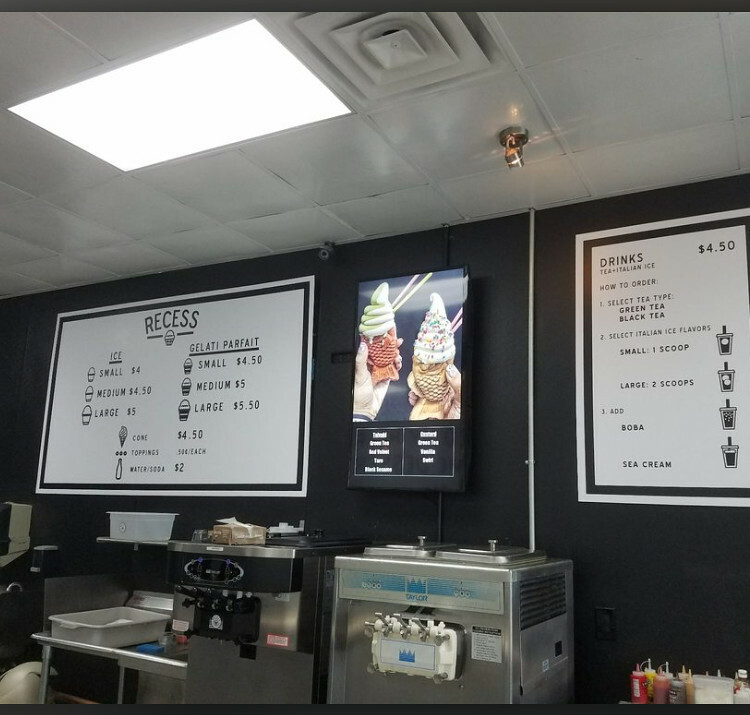 In regards to the Las Vegas location, if you’re visiting Las Vegas and you want to check this place out, it’s not on the strip, so you will have to Uber or Lyft there. I wouldn’t suggest taking a taxi because it might end up costing more to get there. 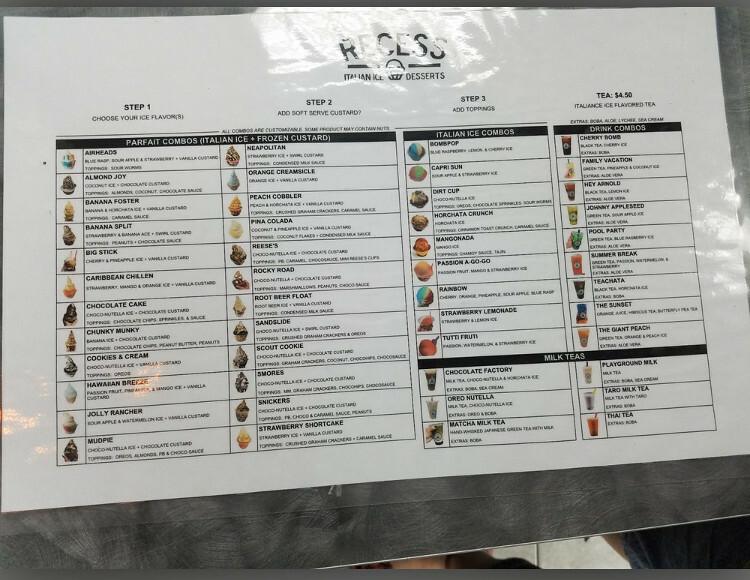 Menu: You have the ability to create your own creations using the italian ice, custards, and taiyakis, but there are also items that are already combined. They usually have about 12 flavors of italian ice, 4 flavors of taiyakis and about 5 flavors (or more) of the custard. Along with all the desserts they also offer milk tea drinks and other boba drinks. Price Point: Prices range between $5-$7 depending on what you get and any additional toppings that you would want to add. Thoughts: What I love most about this place is the fact that it’s unique and away from the busyness of Chinatown and the strip. In Las Vegas, Chinatown is located on Spring Mountain between Rainbow and Wynn. The businesses in this area are packed into buildings and parking spots are difficult to come by. There’s a boba place that I used to love to go to, but it was so difficult to find parking. Cars often end up parking in non-designated spots, so when you try to leave, reversing out is impossible because it’s just too narrow to maneuver a car through. You can say that I try to avoid Chinatown as much as I try to avoid going to the strip. Recess is located on Fort Apache and Tropicana, which is a more residential area. The parking is a breeze;l I suggest visiting them at off hours like right as they open and around 8:00PM that way you don’t have to wait in line. They can get pretty busy and since it’s a small space, the line can get long fast. Depending on what people order, the wait to get your food isn’t too long, the longest item to wait for is the Taiyakis. They have also introduced a new version of Taiyakis which are bear-shaped. The date that this post goes up, I haven’t personally tried it, but I’m sure that will change fast. What I like most about this place is that you can really taste the quality in terms of ingredients used and the way things are prepared. The custards are smooth and creamy and not overpowering. 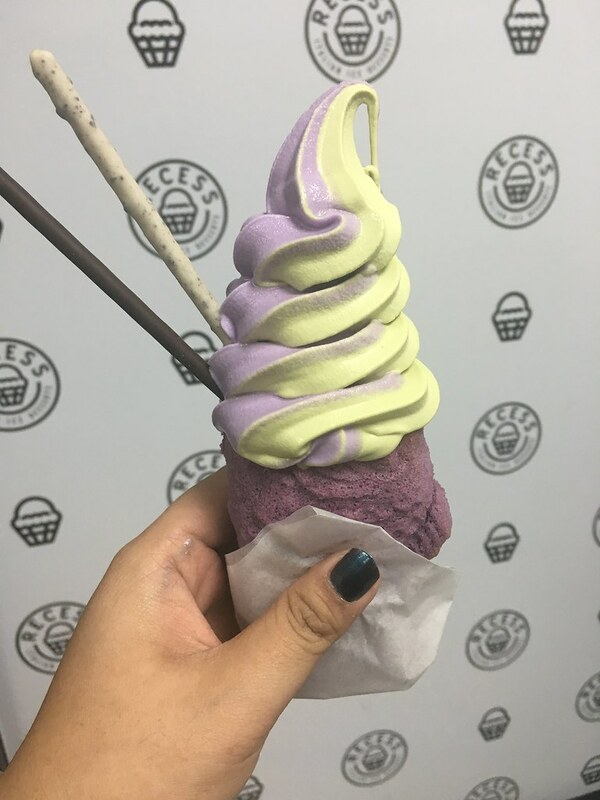 I highly suggest trying the ube and green tea custard (you can get them swirled, just ask). I know green tea can be an intense flavor, and often times when it comes to ice cream, I find that it can have a harsh floral essence to it, which I hate. However, their green tea custard is smooth and the flavor is a toned down flavor; almost as if it’s a milk green tea without the extra floral essence. Though I wish the ube flavor was a tad bit more intense, I understand that a custard won’t have the same flavor intensity as a regular ice cream would, but it’s still delicious! The price-point is fair for what you get. Like I had mentioned the price varies depending on the size that you get, except for Taiyakis, and if you would like to have any additional toppings or add-ins. 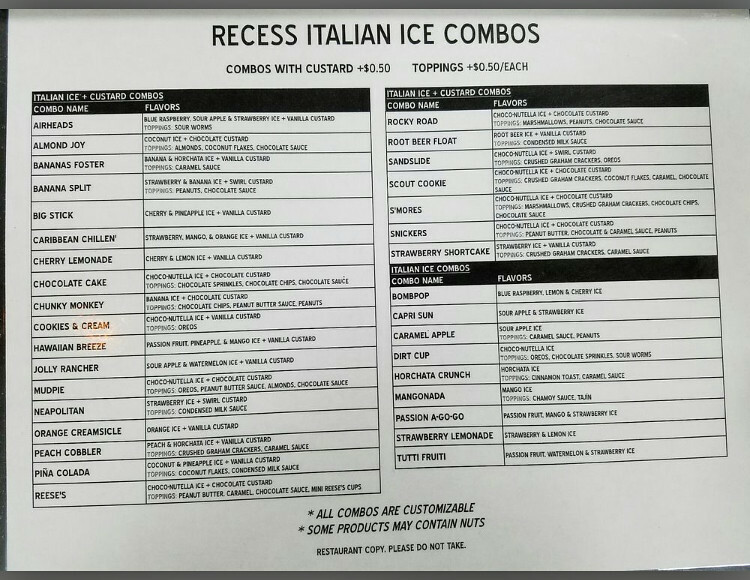 In regards to their Italian ice, the small is enough to feed one person, the medium can feed 2-3, and a large can easily feed 3 people. I suggest coming with a group of friends or family, that way you can each get something different and have taste a little of everything. Let me know if you decide to check this place out and what your thoughts are! If you want to see exactly how “Instagram-worthy” these treats are, you can check out their Instagram @recessice or you can check out my Instagram and Twitter @ciaociao808. Also, if you live in Las Vegas, let me know what your favorite dessert place is! I have a huge sweet-tooth and love to indulge in yummy treats.